Whether this is your first visit to Put-in-Bay, or you have been here many times, Island Club Taxis is available to answer all your questions and provide your transportation. We want your visit to be a pleasurable experience. Please feel free to contact us via e-mail at reserve@putinbayreservations.com or by phone at 419-285-5466 with any questions you may have about our Put-in-Bay taxi service and the island. 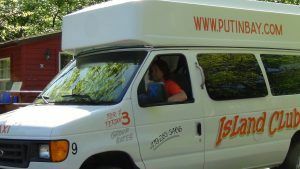 We are available seven days a week, year-round, to assist you with all your transportation needs while visiting Put-in-Bay. Island Club Taxis specializes in weddings, conventions, groups, school groups, business meetings, family reunions, and tours. We offer DISCOUNTED RATES to groups! Island Club Taxis and our other island business partners can assist you with wedding and reception location and arrangements, lodging, business meetings, catering, fishing charters, and camping. Let us do the planning for you and make your event worry free! To make arrangements for your group or just to ask questions about our special group services, contact us via reserve@putinbayreservations.com or call 419-285-5466. Island Club Taxis has been serving Put-in-Bay and South Bass Island year-round, seven days a week since 1997. 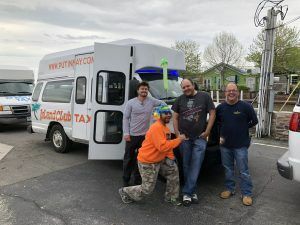 As members of the Put-in-Bay Chamber of Commerce, the company and its drivers volunteer our time to many worthwhile events on the island year-round. The Put-in-Bay event calendar keeps us very busy and we love it! We love being a part of the Put-in-Bay experience for every visitor that rides with us. recommend that you leave your vehicle on the mainland, as there is extremely limited parking on the island, especially in the downtown area where most of the attractions are located. Island Club Taxis will meet you at the ferry boat of your choice and handle all of your luggage and camping gear for you. Our normal business hours are 7:00 AM to 3:00 AM, seven days a week during season. Additionally, we are open 24 hours on Fridays and Saturdays between Memorial Day and Labor Day, including all major three-day holiday weekends. If you need to know anything else about our taxi service, please do not hesitate to contact us via email reserve@putinbayreservations.com for further information on Island Club Taxis, or call 419-285-5466.